There’s something to be said for bands that refuse to kowtow to a record label. I don’t know if there are enough of them anymore, although maybe the shakeup of the industry is finally leveling the field a bit. Maybe there are more bands that can tell a record company where to go when they say “we need a hit” and still survive by carving out an audience. I sure hope so. After watching Beyond the Lighted Stage, you have come away with admiration for the three members of Rush (OK, so if you listen to them and think, that’s only three guys? That still remains an eye-opener for me. Or ear-opener.) Their musicianship remains impeccable, their ability to weave narrative and story into songs is a worthy goal (even if they do, in fact, overreach), and their friendship through the years is something that I find admirable. One storyline of drummer Neil Peart (who is sort of a god-like drummer to most of my drummer friends and also the main lyricist for the band) is particularly wrenching, as Peart loses his daughter and his wife within a short period of time, and in a bit of escapism from the world, hops on a motorcycle for a year of traveling and reflecting. The band came to a halt, as his bandmates worried about him. The movie shows Peart’s re-entry into the life, and into music, with the help of Rush. Watching the documentary reminded me of a webcomic I created around a bass player in a band. The main character — Bassman — considers Geddy Lee to be a god, and starts a viral compaign to get Rush into the Rock and Roll Hall of Fame. I think that Geddy Lee reference comes from memories of my friends, and the fanatical view of Lee as a bassman extraordinaire. Sometimes, my blog will get link backs that I think, who the heck is this? And why are they linking to me? Most of the time, it is some autoblogbot site, just grabbing keywords to generate traffic. 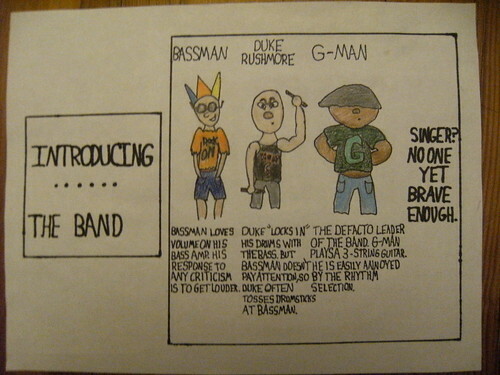 This morning, though, I found a link back to a site that mentioned my old Bassman comic series. Cool. I checked it out, and the post in question is all about composer John Cage, and I had done a few strips once in which the Bassman decides to do some experimental music with some odd objects. It’s funny to see Bassman at the post with all of the videos of John Cage and John Cage-inspired content. Bassman lives! In college, where I was a music minor (and an English major and always wanted those two to flip), I had a professor who was deep into the New York avante garde scene of composition. John Cage was a god to these guys. The other day, I read an interesting profile of Cage in New Yorker and thought I might bring his ideas into my Bassman webcomic. You can peruse the entire Bassman collection (if you dare) here. While I was away on a blogging vacation in August, I also kept creating more Bassman webcomics, in which I am poking fun at my love of music and playing in rock and roll bands. My hope is to get my 12 year old son to take these basic comics and do the artwork. He started the project but then stopped.I think it was right around the time he finally earned an iPod touch. Hmmm.